Willey Standardbred Farm is a small family-owned horse farm dedicated to producing quality Standardbred race horses. 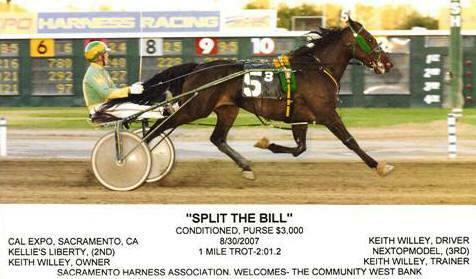 We are located in Herald, California, approximately 30 miles south of Sacramento and Cal Expo, where we race under the Keith Willey Racing Stable. Many of our horses have gone on to a second career after their racing days are over. For instance, K D Winning Bid recently completed his training to become a police horse with the Fresno Mounted Police Patrol. Now, we have donated K D Judge to the Patrol and he has completed his training. Click Here to take a look at Winners scrapbook, or here to look at Judge. The United States Trotting Association recently posted an article on the Fresno Mounted Police Patrol - Click here to read the article. Copyright © 2011 Willey Standardbred Farm. All Rights Reserved.